It’s National Pie Week in the UK from 2 – 8 March. 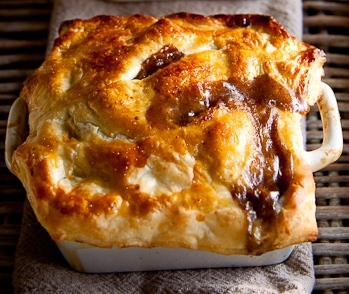 So being a POM myself, and with the cooler weather on the horizon in Canberra, we thought we’d celebrate Pie Week and check out some winter menu meals at the same time; there’s not much beats hearty and warming than a good home-made pie! 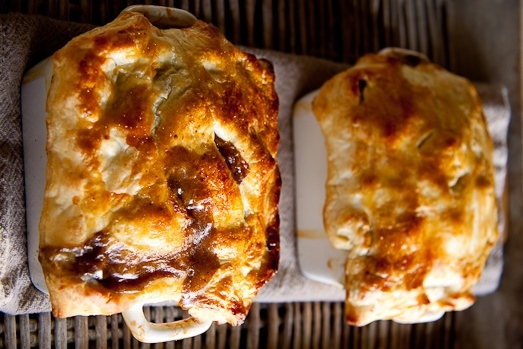 Check out our awesome (and warming) chicken, beef, and lamb pie recipes below—all ingredients are for two small pies. We make our pies in individual dishes and put the pastry on the top. We also use gluten free flour for the pastry, corn flour to thicken the sauces, and use fresh and organic veggies and meat. 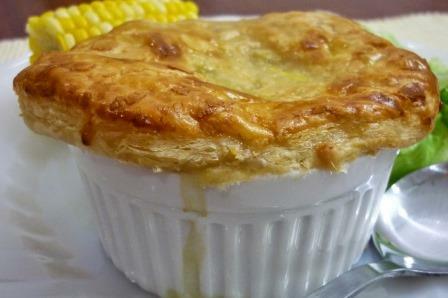 Pies are also a great way to use left-over roast meat and veggies. The dish on the left has a lid for times when you don’t want, or don’t have time, to make the pastry top. Believe it or not I learnt to make pastry in high school and have carried this knowledge with me ever since! This recipe is so easy and makes a great pie topping. The secret to a good short crust pastry is cold—cold butter, cold water, and cold hands. Rub the butter into the flour until it resembles bread crumbs. Add the water slowly and mix until the pastry forms a doughy texture. Sprinkle some flour on your pastry board and knead the dough until you have a nice round ball. Cut in half and either shape or roll out each half to fit the pie dish. We prefer to shape rather than roll as you get a better texture and you can do fancy pinching round the edges. Pre-heat the oven to 200 degrees celcius. Heat the oil in a frypan and add the leek and mushrooms. Sauté until the leek is soft, then add the chicken and cook until just brown. Set aside. Place the corn flour and milk into a jug and mix well. Return the frypan to the heat and slowly add the sauce and salt and pepper to taste. Heat until the sauce thickens and put the mixture into the pie dishes. Put the pastry lids on top and brush the pastry with milk so it browns nicely. Heat for around 20 minutes until the pastry is golden brown. Serve with fresh veggies and enjoy! The secret to a good beef pie is to use really good quality meat, either a nice piece of sirloin, porterhouse, or tender rump steak. You won’t get a nice tender pie if you use cheap cuts; leave them for slow cooking. Pre-heat the oven to 200 degrees celcius. Heat the oil in a frypan and add the beef cubes. Cook until just brown and add the sliced mushrooms. Set aside. Place the corn flour, the crumbled stock cube, and red wine into a jug and mix well. Return the frypan to the heat and slowly add the sauce and ground pepper to taste. Heat until the sauce thickens and put the mixture into the pie dishes. Put the pastry lids on top and brush the pastry with milk so it browns nicely. Heat for around 20 minutes until the pastry is golden brown. This is great served with roast sweet potato and pumpkin! 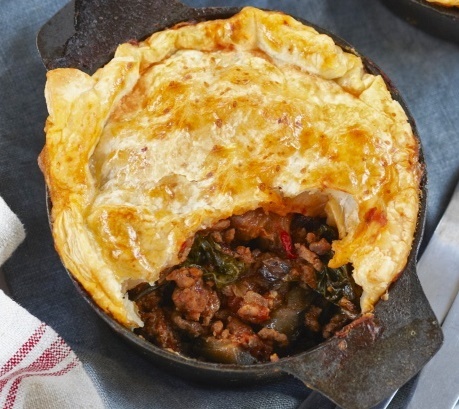 This is an awesome warming and spicy pie, and a great way to use left-over veggies. We serve our Moroccan pies with a couscous and lentil mix. Pre-heat the oven to 200 degrees celcius. Boil (or steam) the carrot and pumpkin until soft and set aside. Heat the oil in a frypan, add the lamb and cook until brown then add the carrot, pumpkin and peas and warm through. Set aside. Place the Moroccan spice, corn flour and water into a jug and mix well. Return the frypan to the heat and slowly add the sauce. Heat until the sauce thickens and put the mixture into the pie dishes. Put the pastry lids on top and brush the pastry with milk so it browns nicely. Heat for around 20 minutes until the pastry is golden brown. Enjoy! What’s your favourite pie? Share your recipes with our blog! This entry was posted in LFW Food&Wine and tagged Beef and red wine pie, Chicken and leek pie, Moroccan lamb pie, Pies, UK National Pie Week on March 6, 2015 by gracienumber1.